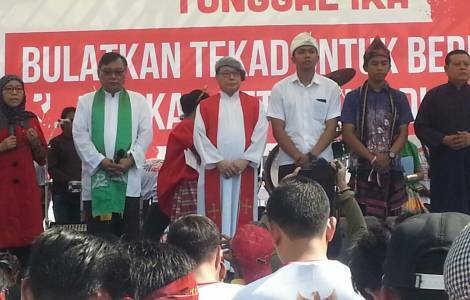 ASIA/INDONESIA - Christian leaders: "Indonesia risks division"
Jakarta (Agenzia Fides) - "At the moment we are worried. Our unity as an Indonesian nation is in danger of breaking. Restlessness and worry have been felt more and more in recent years. There are those who, vaguely or shamelessly, are tempted to follow different paths and ways of the Charter at the base of our nation, the Pancasila. This was seen in many acts and events: in an unhealthy political competition that justifies any means; in the restricted fanaticism that exploits religion and in many other ways. Under such conditions, the desire of our nation to create coexistence and peace becomes difficult to achieve": this is a passage of the joint appeal launched by the Catholic Bishops' Conference of Indonesia and by the Communion of Churches in Indonesia, which brings together Protestant Bishops. The usual joint message, issued on the occasion of Christmas by the Catholic and Protestant leaders, sent to Fides, is titled: "Let the peace of Christ reign in your hearts" (Cfr Col. 3: 15a). Archbishop Ignatius Suharyo of Jakarta and Bishop Antonius Subianto Bunjamin of Bandung, respectively President and Secretary General of the Catholic Bishops' Conference sign the text, together with Henriette T.H. Lebang and Gomar Gultom, respectively President and Secretary General of the Council of Protestant leaders. The Christian leaders show their apprehension: the high ideals of the Indonesian nation, as expressed in the preamble of the Constitution of 1945 - states the text - aimed at "creating unity, social justice and peace, not only among us, but even all over the world, still need our common struggle. We still need to organize and constantly adjust the system and the mechanism of democracy, to concretely realize our common ideals. And it is not easy", adds the message. Indonesian Christian faithful, an integral part of the nation, "are just a small flock": "We cannot solve all the problems we face by relying on our strengths. It is time for us to let the peace of Christ reign in our hearts. The peace of Christ, which reigns in our hearts, is a force that unites and breaks down the wall of division (Eph 2:14). Only with the peace of Christ in our hearts we will manage to open up, embrace and welcome our fellow citizens and to hold them together in unity, moving together towards a brighter future". The message urges Christians to contribute to unity, brotherhood, truth, justice and peace, minimizing the gap between rich and poor, helping to eradicate corruption, breaking down barriers created in the name of ethnicity or religion. "It is an evangelical mandate that we are called to fulfill in our Indonesian land", reads the text.